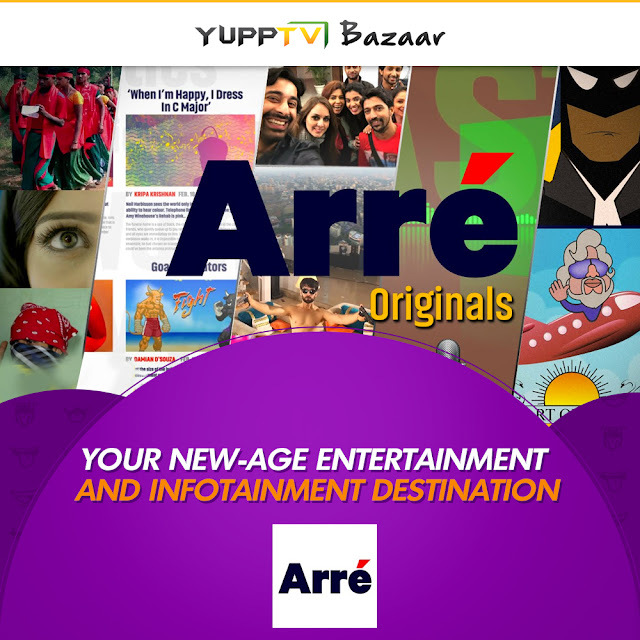 New Delhi, June 29, 2016: Following its rapid expansion spree, soliciting the most thought-provoking and entertaining content, world’s largest OTT player for South-Asian content, YuppTV has partnered with Arré, the multi-genre, multi-format digital media brand. The association will introduce a range of popular and trending web-series, social experiments and reality shows, documentaries as well as non-fiction products from the Arré stable on YuppTV Bazaar, one of the leading online marketplaces for on-demand video content. To begin with, YuppTV Bazaar will host A.I.S.H.A - My Virtual Girlfriend and I Don’t Watch TV, the two trending web-series by Arré. YuppTV is one of the world’s largest internet-based TV and On-demand service provider for South Asian content, offering more than 200+ TV channels, 5000+ Movies and 100+ TV Shows in 12 languages. YuppTV has 25000 hours of entertainment content catalogued in its library, while nearly 2500 hours of new on-demand content is added to the YuppTV platform every day. YuppTV offers Live TV and Catch-Up TV technology. YuppTV has its presence in more than 50 countries. It has recently launched YuppFlix, a movie on demand streaming service for Expat Market and YuppTV Bazaar an online marketplace for the premium content curator. YuppTV is currently ranked #1 Internet Pay TV platform for Indians living abroad and also the largest Internet TV platform from premium content availability in India. YuppTV is the most downloaded Indian SmartTV app and it also boasts of 8 million mobile downloads with 4.0 user rating. Arré is India’s first multi-format, multi-genre digital media brand. Arré brings to India’s new-gen digital audiences a range of contextual storytelling and entertainment using video, audio, graphic-art and text. Its original content ranging from articles that explore sub-culture and popular culture to audio-dramas in partnership with Saavn, the first of which is Trial By Error | The Aarushi Files based on one of India’s most intriguing murder cases, doodles and illustrations that take a satirical look at the world and sociopolitical environment, fiction shows like A.I.SHA, I Don’t Watch TV which is a satirical sitcom series that explores the many unsaid dimensions of India’s over-the-top entertainment television industry and its protagonists. Arré has been working with a range of advertisers to integrate their brands seamlessly into contextual storytelling and entertainment as well as with a range of Video platforms to market and distribute its content.